Whoa! Take a look at that head! Didn't that collar go out of style in, like, 1870? I thought Booger McFarland went to LSU. The only one around here who eats boogers is the frickin' WASHING MACHINE REPAIRMAN. Confirmation call last night: "He'll be there between 8 and 12, but you're one of the first calls on the list." Looking at clock: 12:47 - IS HE HERE???????? HAHAHAHAHAHA. I blow boogers in his general direction. Is he there yet, Guin? Guin, you should call Joe the Plumber (if he doesn't have any campaign stump speeches to make today)! 1:35 and NO WASHING MACHINE GUY! Did you ask what TIME ZONE??? You didn't think I meant 12 noon, did you? Who's the hydrocephalic guy with the floating booger by his impossibly tiny chin? Maybe "between 8 and 12" meant between August and December. An obvious typo. That sign should say "Wolverines Eat Boogers." Not only does he have a head that appears to have been cleaved from Mt. Rushmore, but he's also got a wad of blackened boogers stuck to his neck. I'll have you know that just because I'm green does not give you the right to associate me with boogers, dum-dums! 5:46 pm - Washing Machine Guy has left - and the machine is working. Guin, ask the WMG if he would like to play defense for the Badgers. Showing up late is acceptable if he is willing to finish jobs. This has been your Wisconsin sports and employment report. His head reminds me of a balloon that's about to explode. 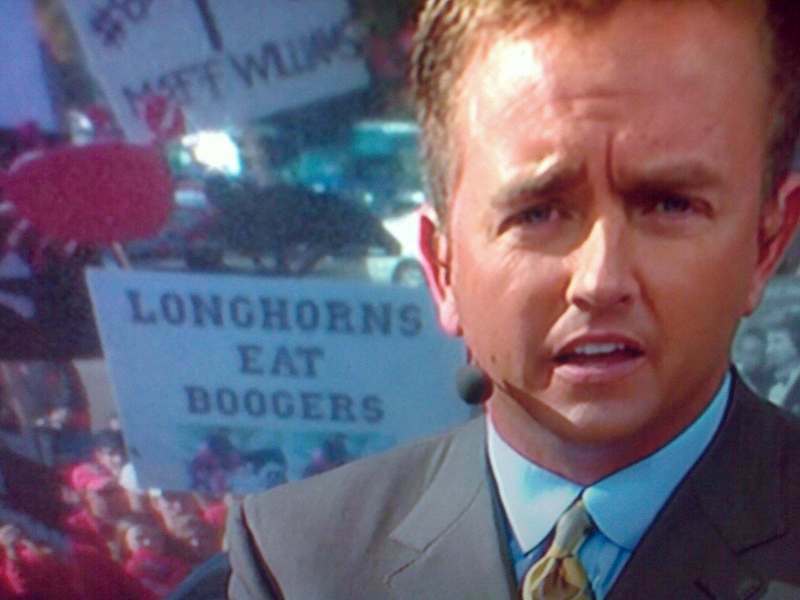 Longhorns certainly ate boogers today, they lost to Tech. Looks like Penn State will be moving up to #2. And they just sat home on their asses today. Probably because here in PA we're still celebrating our WORLD SERIES VICTORY over that...um...state that looks like dangly bits.